“What do you think is the problem?” I asked. “Do you really think your team is incompetent?” I followed up. Andrew was listening, but not sure if he liked what he heard. I continued. This entry was posted in Accountability and tagged competence, uncertainty on February 15, 2017 by Tom Foster. “You look absorbed in something,” I observed. “I am trying to think about projects we have completed in the past that could help me figure out this new project,” she replied. This entry was posted in Planning Skills and tagged ambiguity, future, planning, uncertainty on August 1, 2014 by Tom Foster. “I understand how we calculate profit, but what does that have to do with my organizational chart?” Derrick asked. “You design a predictable profit into your price, but what is it that keeps your profit predictable when you actually deliver your product or service?” I replied. “And so, if something is happening with the predictability of your profit, what’s wrong, where do you look?” I continued. “Something has to be wrong with the system,” Derrick nodded. “So, where do you look?” I insisted. 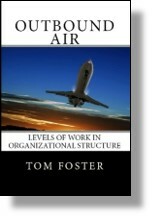 This entry was posted in Time Span and tagged organization chart, predictability, system, systems, uncertainty on April 6, 2012 by Tom Foster.